Fall is here and I am so excited! 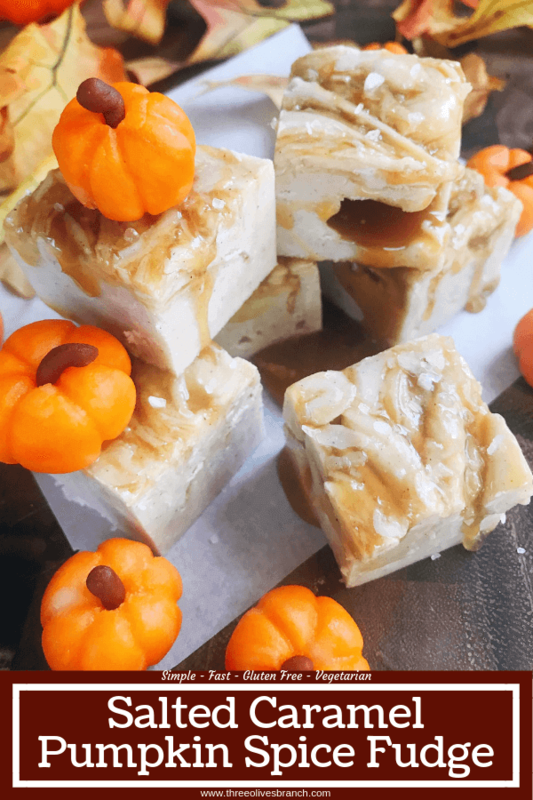 I spend much more time baking and making desserts in the cooler months, and this Salted Caramel Pumpkin Spice Fudge is a festive way to bring in the new autumn season! 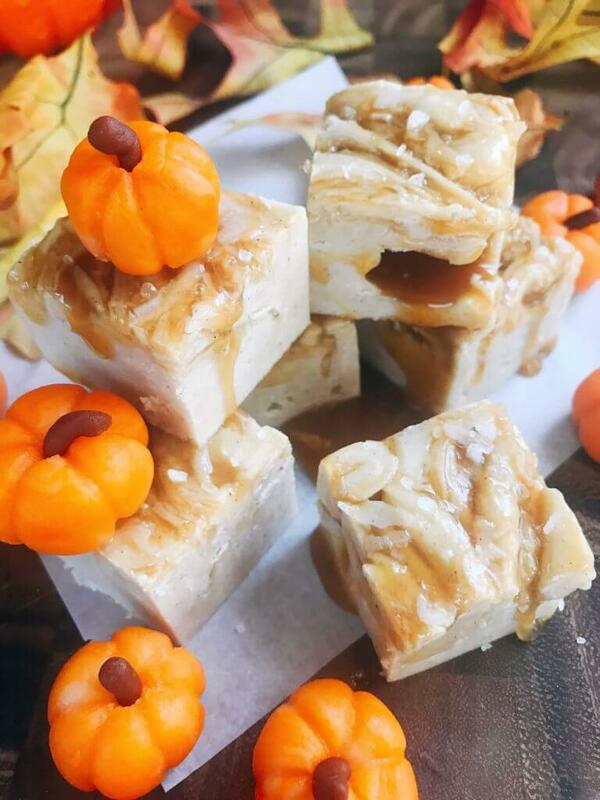 This fudge is made with white chocolate chips and NO marshmallow fluff, resulting in a rich fudge. Of course I had to make these adorable marzipan pumpkins to decorate the Salted Caramel Pumpkin Spice Fudge with, which is perfect for fall/autumn! 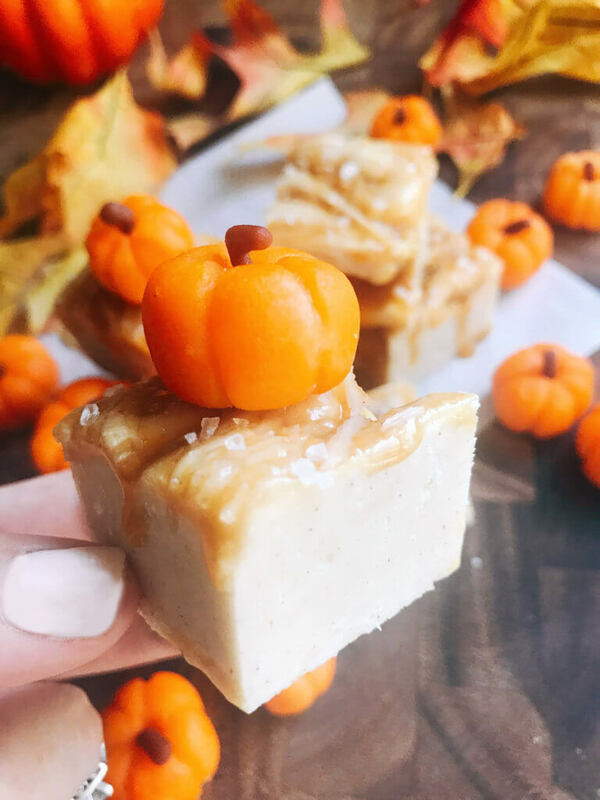 Learn how to make these marzipan pumpkins here and use them on all of your desserts and sweets for the season, especially Halloween and Thanksgiving! If you swirl the caramel too deep, you may get caramel pockets like you can see in some of the pictures. While this is fun to see it gushing out, it does make it stickier and difficult to eat. The same is true if you use too much caramel and have a thick layer on top. But if you are okay with a little mess, use more caramel! 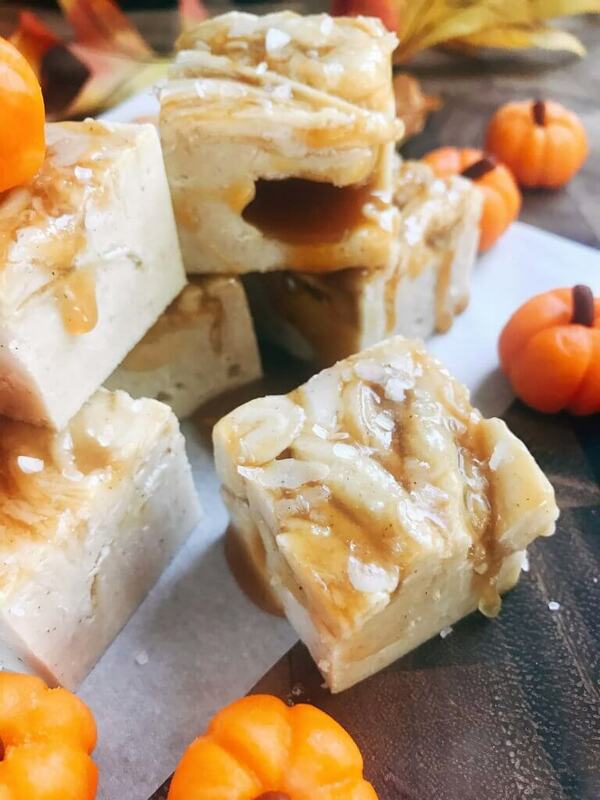 There is no actual pumpkin in this Salted Caramel Pumpkin Spice Fudge because it makes the mixture rather wet and difficult to set. 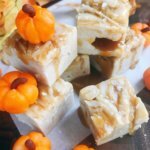 And I love simple, fast fudge recipes for a quick treat! But you will still get a punch from the pumpkin spice seasoning. I can’t wait to make these all fall long! 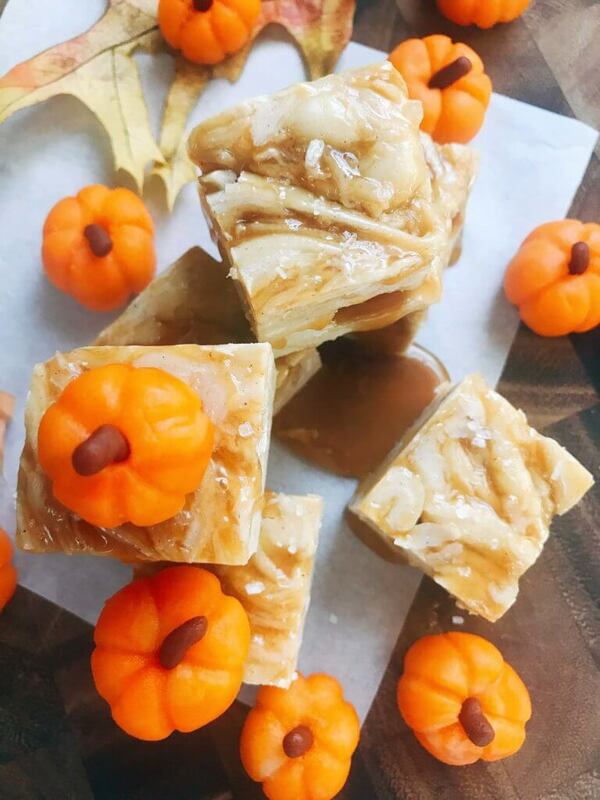 What are your favorite fall treat to make? 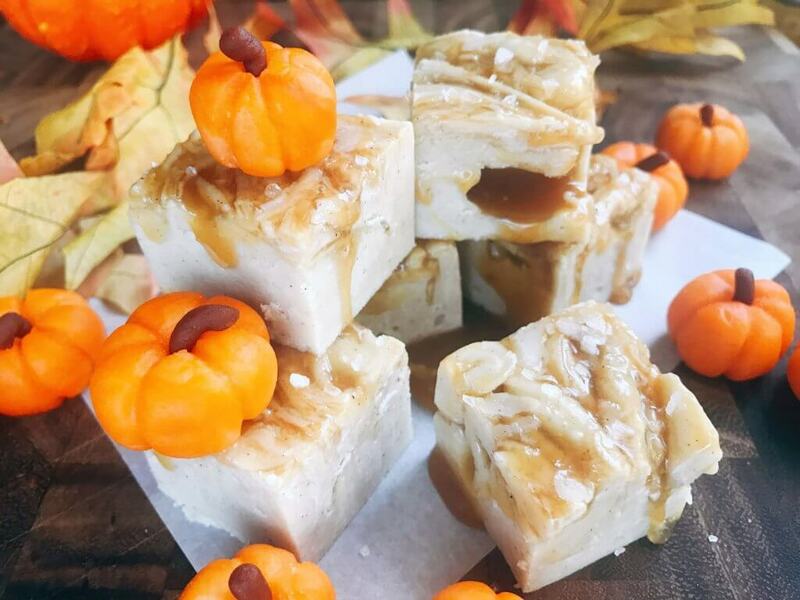 Marshmallow free, this white chocolate fudge is flavored with pumpkin spice and salted caramel sauce swirled on top. 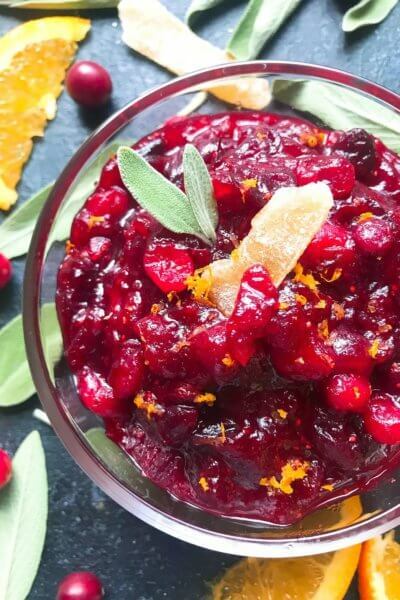 A seasonal treat for fall, Halloween, and Thanksgiving. Line a 9x9 baking dish with tin foil. Flatten out the bottom and sides. 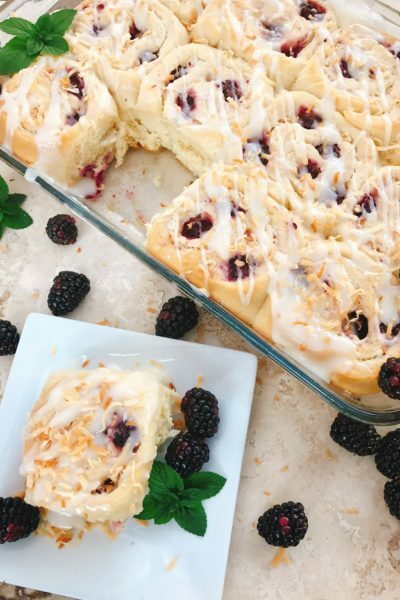 In a medium or large microwaveable bowl, combine the sweetened condensed milk and white chocolate. Microwave on 30 second intervals, stirring thoroughly in between, until the chocolate is completely melted. Add the pumpkin spice, vanilla extract, and salt. Stir to combine. Pour the white chocolate mixture into the baking dish, pushing it into all the corners. Pour the caramel sauce over the white chocolate. 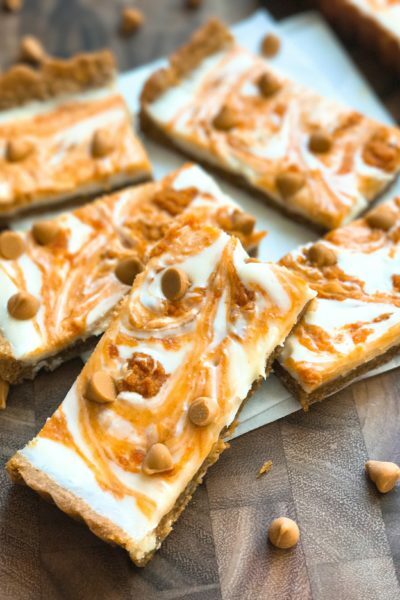 Use a spatula or knife to gently swirl the caramel into the white chocolate. (If you dig too deep with the knife, it will create pockets of caramel inside that will leak later - your choice). 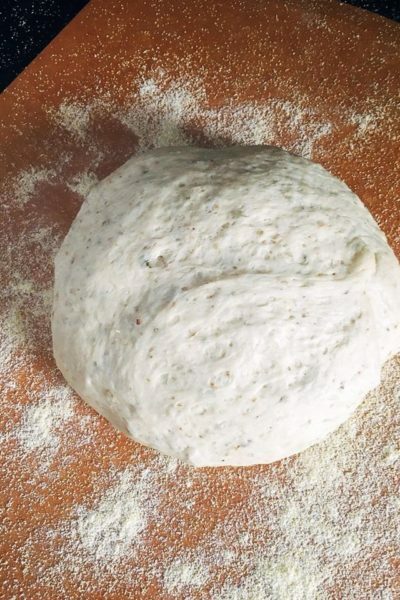 Sprinkle with kosher or sea salt. Refrigerate the fudge for at least two hours, or leave out to solidify (typically at least 4 hours). When ready to serve, cut the fudge into a 6x6 grid for larger pieces or to your desired size. If the fudge is too hard, let it sit at room temperature for a few minutes first. If your caramel is like liquid at room temperature, it will be the same in the fudge. If solid at room temperature, it will be solid in the fudge. Choose according to what you prefer. If you cut this fudge into a 6x6 pattern, you will get good sized pieces (approximately 1.25-1.5" square). Make it stretch further by cutting each row smaller. Grab instructions here on how to make these marzipan pumpkins to decorate your fudge with!